Our Round Viking Shield is made from solid wood which has been prestained a dark brown. The center features a steel boss with decorative steel strips as well as a complete steel rim which helps protect the edge of the shield. All steel fittings are bolted on. The back is covered in felt and has a grip and arm strap. 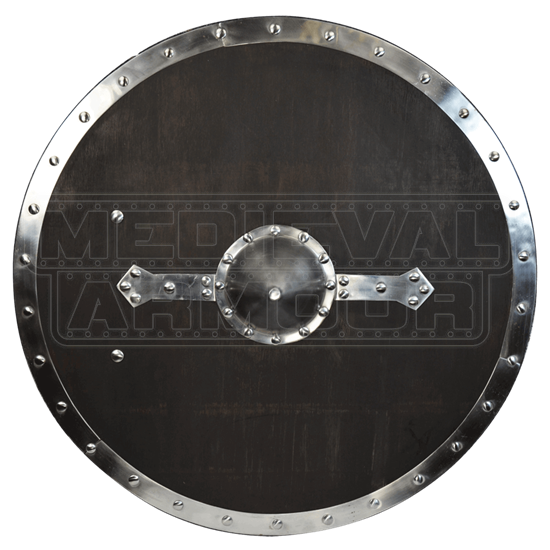 This historically inspired shield is perfect for any Viking, barbarian, or warrior wanting a rustic style shield. I bought this years ago and it is great! I replaced the wooden handle with a metal gate handle from home depot just because the wood doesn't really handle the weight of itself. It is heavy but solid and functional.